In another life, Los Angeles-based singer-songwriter Imaad Wasif might have been a poet or a priest. He draws inspiration from beyond the veil, seeking connections and cosmic patters in the hopes of expressing the simplest but most profound message to his listeners: We are not alone. The urgency of that communication, and his need to convey it, give both his delicate guitar ballads and his fervent rock songs a ferocity and focus that resonates with every note. Wasif goes far beyond the here and now in his music, but he is very much of this time. He is a rock musician who came of age in the Coachella Valley of the 1990s. Early on he played live and in the studio with Lou Barlow’s Folk Implosion. In 2006, Kill Rock Stars released Wasif’s self-titled solo debut, an acoustic psych gem, which had a lean, hushed intensity. Around the same time, he was enlisted as a touring guitarist and opening act for Yeah Yeah Yeahs. 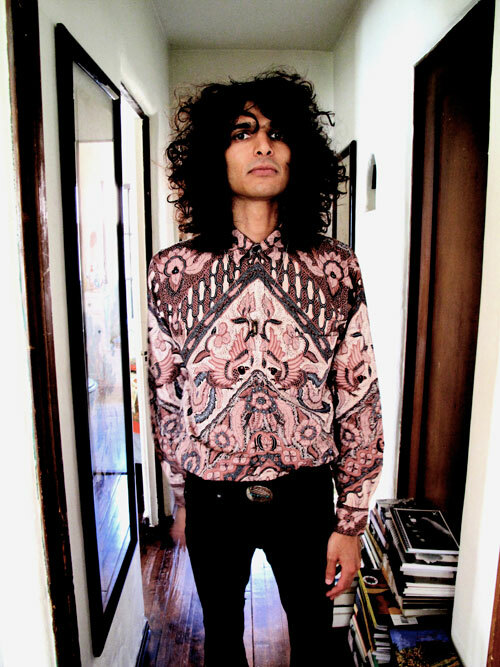 Sophomore album, “Strange Hexes,” revealed Wasif’s varied influences. The album was recorded with his band Two Part Beast (Bobb Bruno and Adam Garcia) and self-released in March 2008. That album was the first to hint at the distinctive sound Wasif has ultimately crafted for himself; a blast of post-modern psychedelic rock that is at once potent and refined. The album, which will be re-released by Tee Pee Records in 2010. Having gained a reputation for his intense live shows while opening for RTX, The Raconteurs, Neko Case, Arthur Lee’s Love and Sebadoh, He can also be found playing guitar on “Little Shadow” from the Yeah Yeah Yeahs’ latest album, “It’s Blitz!” and Lou Barlow’s forthcoming solo album, “Goodnight Unknown.” His collaboration with Karen O ofYeah Yeah Yeahs, Bradford Cox of Deerhunter, and “Little” Jack Lawrence of The Raconteurs and Dead Weather on the score for the Spike Jonze-directed film adaptation of “Where The Wild Things Are”. The theme of love in its many guises, both as redemption and call to arms, is one that Wasif returns to again and again in his songs. Its mythical quality becomes a springboard from which he explores the mysteries of life and the universe on his third album, “The Voidist.” Recorded with Two Part Beast, plus guests Dale Crover (Melvins) and Greg Burns (Red Sparowes), by Chad Bamford (Weezer) with additional recordings by Mathias Schneeberger (The Obsessed, Gutter Twins), the European release is due from Tee Pee Records in June 2010.